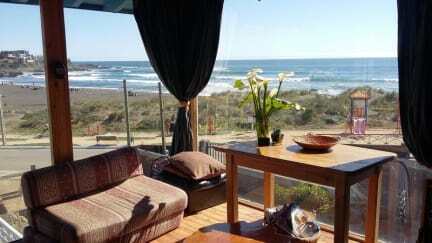 Welcome to Pichilemu Hostel Surfers View perfectly located right in front of the beach in Infiernillo, Pichilemu. 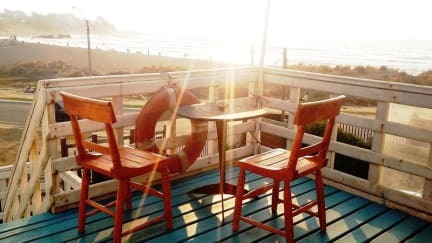 Offering a big sun terrace with ocean view, Pichilemu Hostel has the perfect location to explore the surroundings only minutes away from the bus station, minimarkets, restaurants and surf schools. All rooms have Ocean View and access to the big garden that invites to a BBQ watching the Sunset. The Hostel offers a Bike and a Surfboard rental and has its own skate ramp. Free WIFI is featured and free private parking is available on site. We speak German, English, Spanish and Portuguese and help you with everything you need to spend a wonderful time in Pichiliemu Surf City. Check out from 09:00 to 12:00. Payment upon arrival by cash. We do not accept Credit Cards.